THE RIDER MAKES THE MACHINE. THE MACHINE MAKES THE RIDER. 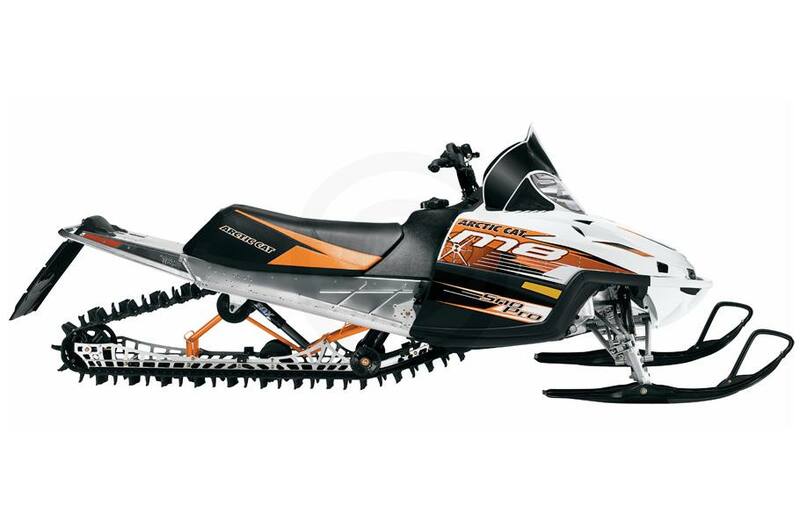 The M Series is by all accounts the toughest, most capable mountain sled in the world. It goes where you point it with as much certainty as a laser guided missile. Power is never in short supply. The M1000 sports an altitude-defying EFI 2-stroke with 50mm throttle bodies, multi-stage APV exhaust valves, Exhaust Pipe Temperature Sensor and two spark plugs per cylinder. The 800 and 600 are cut from the same mold. This is high-tech, no-fuss 2-stroke performance of the best kind. Home to these lay down engines is the rider-forward Mountain Chassis. 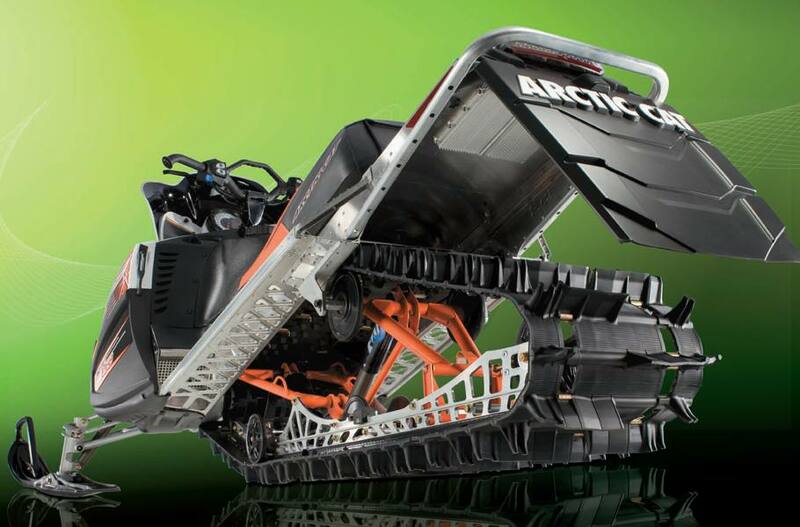 It is the product of Arctic Cat's undying desire to create a ride that blurs the line between machine and rider. This chassis is more solid than the rock it was built to climb. 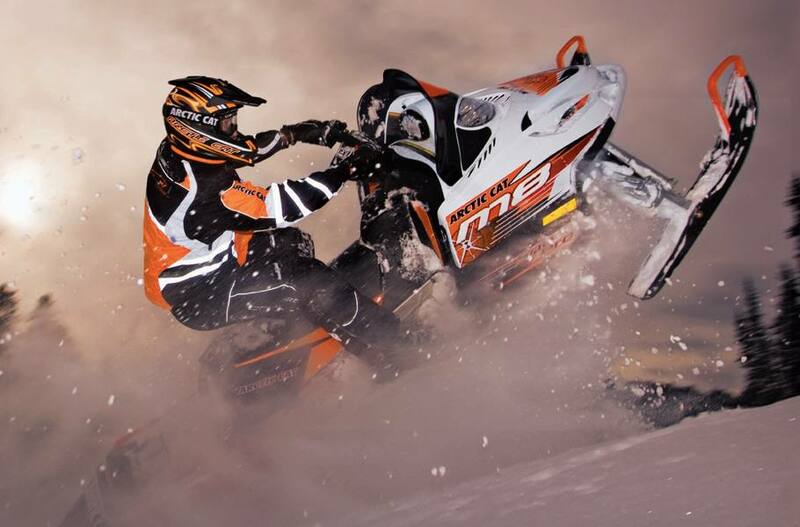 Whether you go with the 153" track or the 162," the sled's weight is 22 lbs. lighter than last year's model. Pair lightweight and great handling with enormous power and you have a machine that soars past the competition. FOX® FLOAT REAR SKID: We did away with the torsion springs and redesigned the frame to decrease unsprung weight while reducing unwanted track tensioning. This improves ride quality and comfort. The rear end is dampered with a lightweight aluminum FOX® Zero Pro gas shock on the front arm and a FOX Float shock on the rear arm. FOX® FLOAT SKI SHOCKS: FOX® Float Ski Shocks give you the ultimate in suspension performance. The shocks utilize FOX's quick-adjust load optimizing air technology and are up to 6 lbs. lighter than the conventional coil-over shock. TELESCOPING HANDLEBARS: The mountain handlebar gets a new telescoping steering system that creates up and down adjustability without adding extra weight. Drop it down on the trail. Raise it up in the powder. The telescoping handlebar features easy one hand adjustment with 12 positions. 800 LAY DOWN ENGINE: The 800 engine is a 2-Stroke 794cc Liquid Twin with Batteryless Electronic Fuel injection. The engine is "laid down" in the chassis to move snowmobile mass toward the ground and effectively lower the center of gravity. BEFI adjusts for temperature and altitude. In addition you can count on quick starts, great fuel economy and cleaner emissions. The 800 also features an Exhaust Pipe Temperature Sensor™ and Electronic APV™ Exhaust Valves to regulate pipe temperature, optimize performance and cut down emissions. ENGINE REVERSE: Push-button electronic reverse gets even better. Now a feature of the engine, not only is it smooth, it's also a weight saver that sheds 8 pounds. POWER CLAW TRACK: The new M-Series Power Claw Track is nothing short of miraculous in the steep and deep and surprisingly well behaved on the trail. Two track lengths are available: the 153-inch and the 162-inch, both 15" wide, with grabby 2.25" paddles. 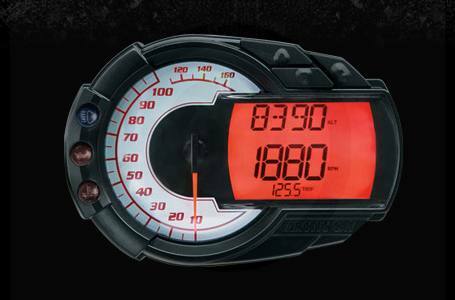 DELUXE GAUGE: The deluxe gauge lets you choose between digital and analog speed and tach readouts. There is also an odometer, two trip meters, engine hour meter, clock, fuel level indicator, altimeter, reverse indicator and warning lights. It also serves as a hub for the optional Cat Comm communications system. TRACK WIDTH x LENGTH x LUG: 15 in. x 162 in. x 2.25 in. LENGTH x WIDTH: 132 in. x 46 in.